Is It Chunky Checked Scarf Wheather Yet ? Call me crazy but I’m actually excited for Autumn and Winter to be here ! Wood fire, tea, candles, warm coats, hot chocolate, cosy night-in, cute slippers, comfy PJs and chunky scarfs. This all screams heaven to me ! Dare I add Christmas ? I know I’m not the only one thinking about it. Is it acceptable to already be excited for Christmas at the end of September ? Probably not. I’ll keep that for later. Oops. However there already is a slight autumnal vibe in the air and I managed to sneak three autumnal accessories into my outfits. These black boots are exactly what I was looking for. I found them on zalando (thank you ever so much Mélody !) and almost had a heart attack when I saw that they were out of stock. Fortunately I managed to track down a pair in my size. The heel makes them a bit more classy but it’s a chunky one (and not too high) so they’re still very comfortable and appropriate for everyday wear. The tassel is a nice touch to make them a bit more unique. I’m not one for very bold lipsticks but Autumn does mean berry toned lip colours. 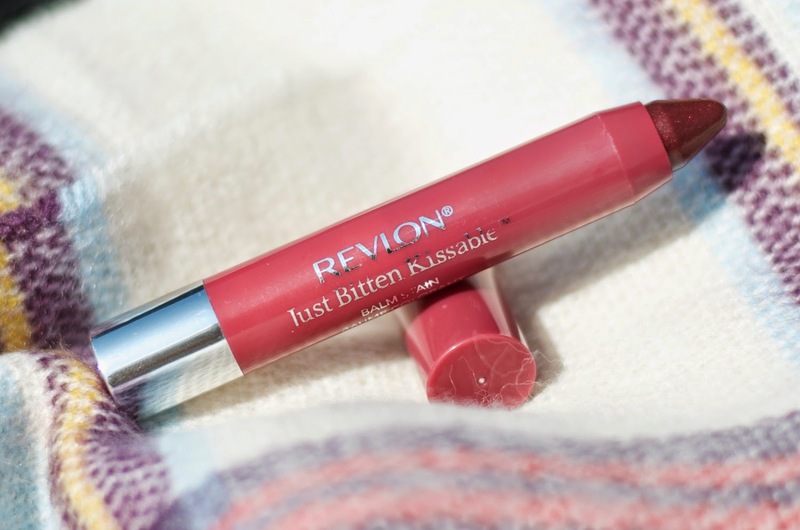 So I use this Revlon Just Bitten Kissable Balm Stain in Crush that I just pat on my lips to be left with a sheer wash of colour that lasts (it is a stain after all). Last but not least my “oh-so-comfy” new scarf ! I picked it up from Pieces which is (I think) a sister brand to Vero Moda that always has very nice accessories. (I found one of my favourite scarf there last year.) I know that I’ll be sporting that one most days this season. I like that it includes many colours and it’s very soft and comfy. Do you also like Autumn/Fall ? What’s your favourite thing about it ? Revlon Colorstay Moisture Stain Review | Love or Hate ? I'm so excited for autumn and winter too! 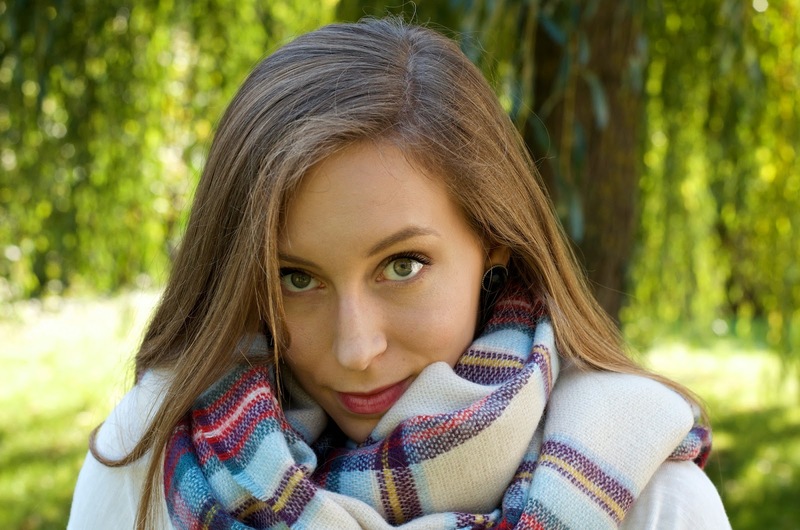 I can't wait until I get to wear sweaters and scarfs regularly (although I've already worn my big tartan scarf a few times… couldn't resist…). I'm such a coward when it comes to lip products, but I like the look of that lip pencil! Might try it out. Aww thanks it means a lot. I've been working hard on these photos. You can pretty much do that with any lip colour that you find a bit too dark… I really like to do that. Aaaaaaaaaaaaahhhhh tu es magnifique sur ces photos!!! Et je comprends tout à fait ton envie d'hiver et de Noel – Let the cold come!!!!!!!!! I'm excited for Autumn too, my fave thing about it is curling up by the fire with a hot chocolate! I'm loving your picks for the cooler months, especially the lippie! Absolutely love that scarf! I'm so excited for the colder months! Have you tried it ? If not, you should ! Moooh =) Merci ma cocotte ! 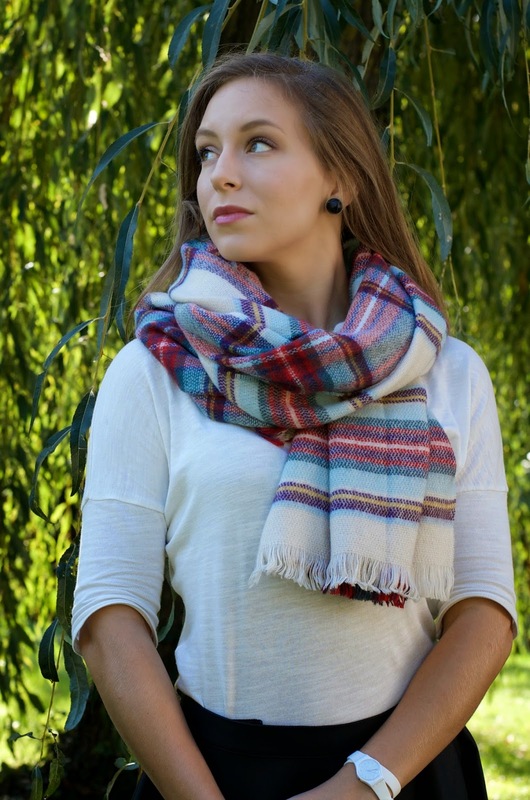 love this scarf 🙂 I have just picked up a tartan scarf, they are definitely an essential for Autumn! Love your scarf!! Checkered scarves are one of my favorite things! And who doesn't like a chunky scarf? ?